Three Musketeers: Elixir Cost increased 9 -> 10. Freeze: Damage -6%, Freeze Duration Reduced 5.0sec -> 4.0sec. Cannon Cart: Hit Speed faster 1.3 -> 1.2. Knight: Hitpoints +2.5%. (Max level hitpoints is 2014). Dart Goblin: Hit Speed slower from 0.65sec to 0.7sec. Damage per second for max level is now 207. Clone: New Clone placement – Clones are now placed behind Cloned troop. Token Trading upgrade – You can now select four cards that your clan members can give you in cards trading. This gives more flexibility to you and your clan mates to make an exchange. New Arena Called Spooky Town – Spooky Town Arena is starting at 3600 trophies. The trophy count of all arenas was updated to spread out evenly between arenas. Another related change is rearranging cards within the arenas. Cards already unlocked will not be affected even when dropping to a lower arena. New Hogs Game Modes – Royal Hogs will be spawning automatically for both opponents every 12 seconds. Mini-collection Game Mode – Build a deck out of a collection of 40 cards. The wall breakers – A new card that will be released on February. Two Barrels with Gunpowder running straight to the tower and exploding. The tournament system is revamped with a new rewards system. The more you win tournament games the more rewards you can get. Every time you win you will advance up the reward track. There are free rewards you get right away and at the end of the tournament you may choose to unlock all the bonuses for gems. On top of that – Exclusive rewards will be given to the top players in the leaderboard. These rewards cannot be achieved unless you play the tournaments. Last but not least – The new tournaments will be global. This is one of my favorite new feature – You can continue a special challenge from your last success point. You keep your wins and start from zero loses. Now you can complete all challenges and get the best rewards. Star levels provides new cosmetics for max level cards. They are unlocked with star points from the moment you hit king level 13. From that point you accumulate start points every time you donate or upgrade a card. With the star points you can unlock star levels. The chance of getting trade tokens in war bounties will be double than current probability. War bounties may also include gems. New way to get emoticons – The emoticons will be available in the shop, so you will be able to buy them with gems. Speed up your request card timer and get more cards from your clan. A 1v1 new game mode that will be released for a limited time. The game mode is a reference to Supercell’s new game – Brawl Stars. Protect your safe and get your opponents gold. It will be easier to search for a new clan. You can add new friends from a 2v2 game. Very soon – Stay tuned for the release date. The Ramp Up challenge is about to end soon. I’ve tried a new deck that I’ve built specially for this challenge. The deck is based on the giant and balloon. With average elixir cost of 4.1, no need for the pump specially when the moving into double time and triple time. Giant – The big tank that walks in front of all other cards. Used both for defense and attack. Balloon – Great attack card used with the giant or the inferno as its tank. When used correctly can destroy a tower very fast. Furnace – Great defense and attack building. Very good in defending the towers and helps the attack with its fire spirits. Inferno Dragon – It’s main purpose is to destroy enemy’s tanks. Bats – Quick support, usually behind other troops or to target grounds troops with only 2 elixir. Witch – I like to counter Pekka which was very popular is this challenge. Great behind a tank like the giant. Fireball – A very useful spell. If your opponent has a three musketeer than save the fireball for it. This is in a nutshell about my winning deck. Supercell just released statistics about the 20 win crown championship challenge. 9989 players qualified to the next stage from a total of 27.4 million unique participants! Can you guess what was the most popular card? The reason for the ZAP being so popular is probably the rise of the Bats in many decks. 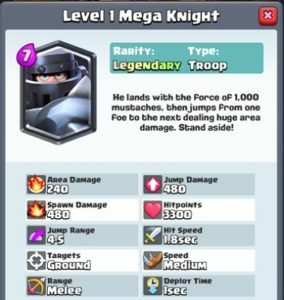 Today is the last chance to win the legendary Mega Knight card! If you still want to win it from the challenge than checkout our list of top players in action. While watching each deck and its strategy think also how you would defend against these deck with your selected deck. Planning in advance your strategy against different types of decks will help you make the right decision in real time. So this list is not only what cards to select but also popular decks you will probably fight against. Same deck as chief pat. It’s still always fun and informational to listen to CWA’s commentary. What is your preferred deck? Share with us your favorite deck. Good Luck! The Mega night is included in each deck. It attacks only ground troops and buildings with area damage of 240, but with spawn or jump damage of 480!!! You can choose any card for your deck even if you haven’t unlocked it yet. In this post we will gather best decks to play in the coming challenge. 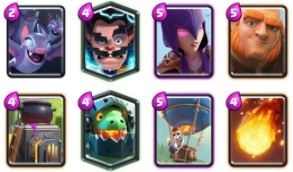 This is a known version of a hog cycle deck, yet in this deck the mega knight replaces the Pekka. Check out the following video on how to use the deck. In this video Chief Pat, plays the deck. You may consider replacing the goblins with the mini pekka. Notice that the videos above created before the challenge started, so all the battles are in the clash royale’s developer arena. What is your deck for getting a free mega knight?